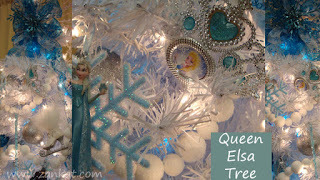 Hang the glass ornaments throughout the tree, placing the smaller ornaments near the top of the tree. 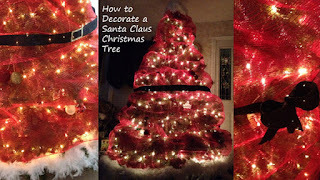 Add foam Christmas trees around the tree, filling in any gaps. Evenly space the ugly sweater ornaments throughout the tree. Top the tree with matching ribbon and sprays. One can purchase the Ugly Sweater ornaments here or simply decorate your own. To do so, use baby or Barbie doll clothes and add tinsel / sequins to the shirts. 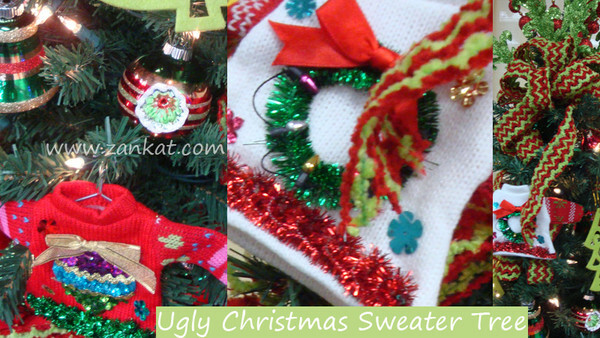 Find out How toMake an Ugly Christmas Sweater even Uglier. 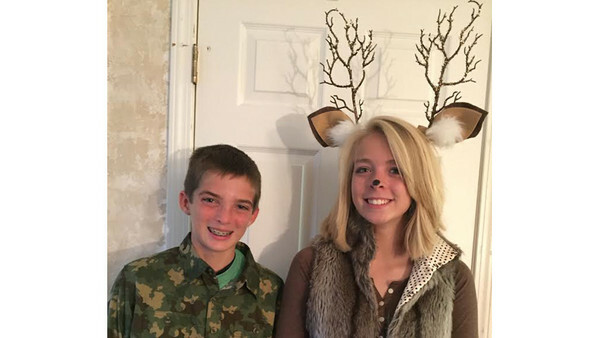 Stand out from the crowd even in camouflage with this unique couples Halloween costume: a hunter and deer. This do it yourself costume is easily created with supplies from your own closet or local thrift store. Or, one can purchase the supplies from the comfort of your own home on Amazon.com. To dress as the hunter, simply put on a camouflage shirt or fluorescent hunting vest, carry a bow & arrow, and paint the face to be ‘dirty’. To dress as the deer, place the deer antlers on top of head, slip on a brown shirt and fur vest. Add black face paint to the tip of nose. Do not get singled out this Halloween! Create your own costume or shop early and plan ahead with these hilarious couples’ costumes available on Amazon.com. Prime members receive free 2-day shipping on millions of items! 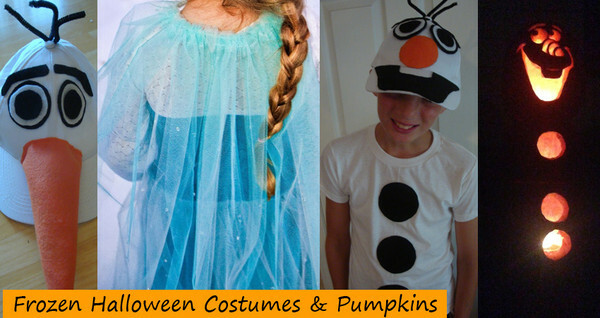 Visit the Pinterest board, Halloween costume ideas for couples, for more cute Halloween costume ideas for couples. Snowmen: Guys can dress up as a snowman wearing a white tee shirt, white shorts and a top hat. 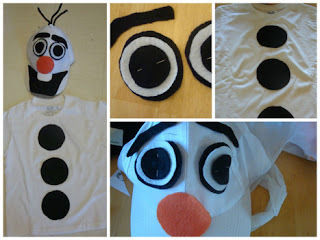 Learn how to make an Olaf the Snowman costume here. Ladies, create this easy do-it-yourself snowman outfit by following these instructions. Run, run Rudolph (the song): Team members can dress up as reindeer wearing a brown running suit. Gals, put your hair up securely in a reindeer sock bun or wear a flirty reindeer costume complete with antlers and tail. Purchase red light up noses for your face. What’s reindeer without a Santa? Fellas, put on the Santa cap, white beard and lace up those running shoes! Other participants can dress as Santa’s elves with a jolly elf kit. For a more traditional running outfit, one can wear Christmas themed sleeves, knee highs and a headband. 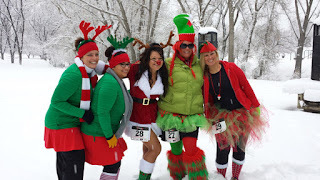 Other Jingle Bell Run costume ideas include: dressing in the popular Ugly Christmas Sweater, wrap oneself up as a Christmas gift complete with a bow on your head, characters from a Christmas Story or the Grinch Who Stole Christmas. Whatever the costume, enjoy the race and support a great cause: The Arthritis Foundation. 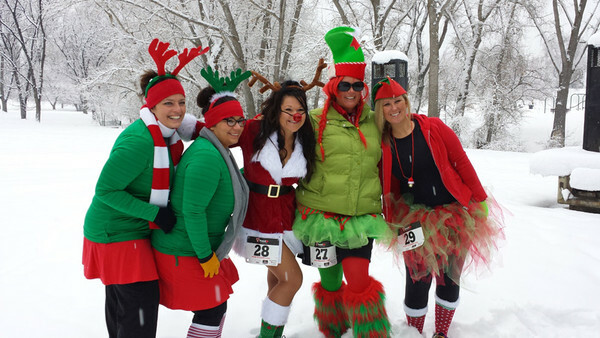 For a Jingle Bell Run near you, visit The Arthritis Foundation online and sign up today! To create the lion mane, simply wrap rounds of yarn around your fingers like you are making a yarn pom-pom. Tie a length of yarn around the middle of the rounds of yarn to secure. Cut across the rounds of yarn on opposite sides and fluff. Repeat this step numerous times, making plenty of pom-poms for the mane. Cut 6 full lengths of yarn to create a thick headband. The length of these strips should be long enough to tie around your head. Tie each end of the braided cord to secure. Starting in the center of this braided cord, tie the pom-poms to the cord. Continue to tie the pom-poms to the cord until the entire cord is covered. Wrap the finished mane around your head and tie to secure firmly in place. Complete the costume by adding a nose and whiskers to the face using Halloween face paint or an eyeliner pencil. Add additional fluff to the costume by creating more pom-poms for cuffs and the end of a tail. Make this a group costume by adding a dentist costume and / or game hunter. 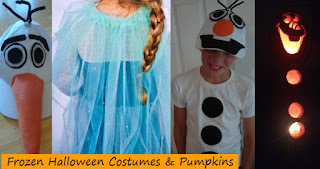 Princess – The Royal Family and Disney princesses make this one of the most popular costume ideas for little girls. Dress up as Disney’s Cinderella or be your own queen with these accessories. Batman: complete costume includes one piece jumpsuit with mask, cape and boot tops. Padded muscular chest makes for one cute Batman! 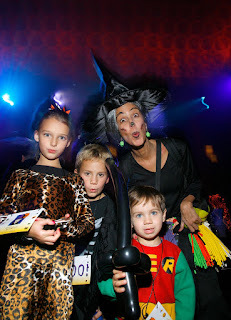 Kids can choose to go as a group with this theme by including a Robin or the Joker. 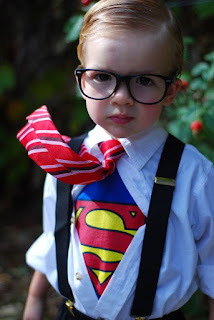 Action / super heroes remain popular for boys. From Spiderman to Superman, many youngsters become one with super powers on Halloween night. Create your own Superman with items you may already own! See how. Animal – Lions, tigers and bears, oh my! With the popularity of Cecil the Lion, look for many little lions running around this year. 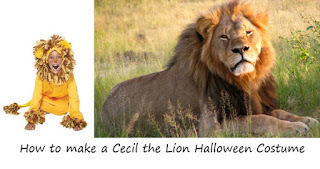 Visit How to make a Cecil the lion Halloween costume for detailed instructions. 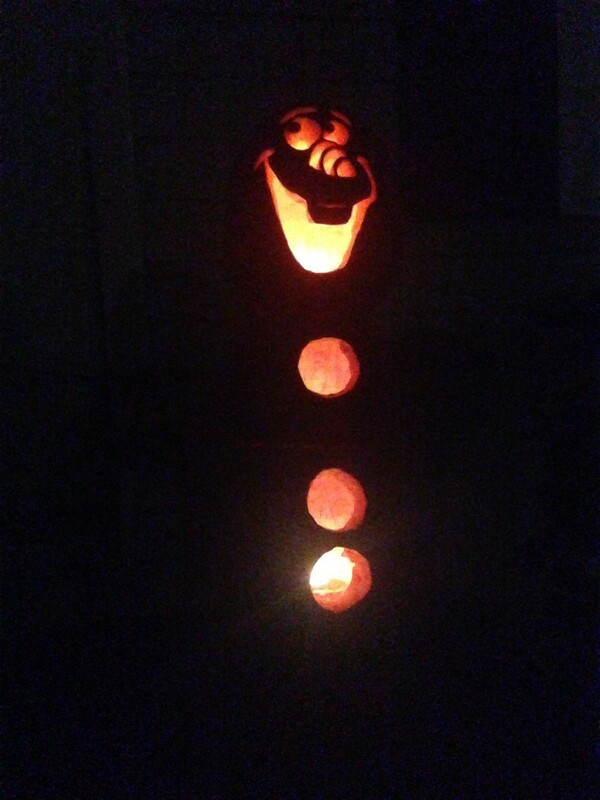 Disney Frozen character – Olaf and Elsa will not be forgotten this year. Purchase the complete costume online or create your own Olaf by following these steps. Elsa’s cape is easier to make than it looks. See how. Other costume ideas rounding out the top 10 include: Star Wars characters, zombie, witch, pumpkin and Despicable Me Minions.